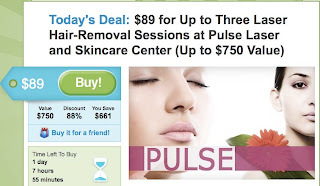 Kat Dy Finds: $89 for three laser removal sessions? "Groupon features a daily deal on the best stuff to do, see, eat, and buy in a variety of cities across the U.S., Canada, Europe and soon beyond (read: Space). We sell stuff we want to buy. 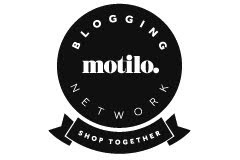 A great price is only half the battle - it's also got to be a great product or service. Between our top-rated business partners and unbeatable prices, you should feel comfortable venturing out and trying something new - just because it's featured on Groupon. We want Groupon to be an addiction you can feel good about." Although I've never bought in the past, I am sorely tempted to buy today's deal. 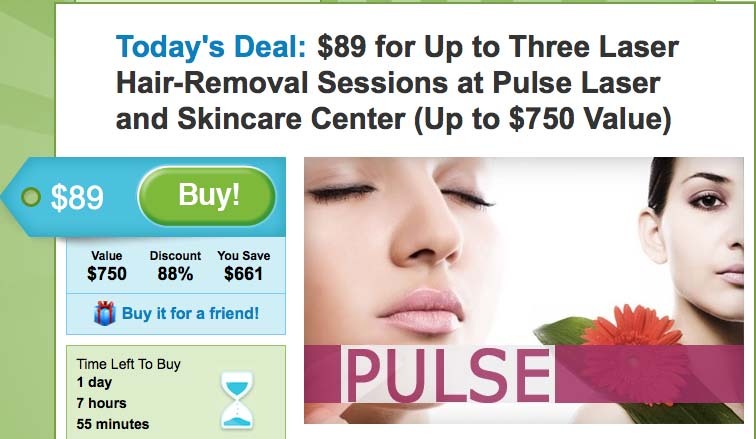 Imagine three laser sessions for $89??? Even when converted to Philippine pesos (yes, I still have a habit of converting even though everybody tells me it's not the best thing to do in one of the most expensive cities in the world! ), it comes out to only Php4,000, which is about the price of one laser session. 2,537 people have already bought! I was also wondering if the Candela laser is any good. I know there are different types of machines, I just never remember which ones are the best. If anybody has ever tried this, do let me know! I just might lift my buying ban before the weekend is up! KAT! I had it done at Clarity in Shangri-la. They had a promo so I got six sessions, and then they threw in one for free. I think it was about Php23,000. It should still be in that same price range. I also got the bikini package at Facial Care Center but I got a super mega discount, it was probably P30k plus minus, for six sessions. The only problem is I haven't finished the treatments and I'm out here na! TARA: Yes it's sooo cheap. And yes, Google is always my friend for anything haha! But you should think about getting lasered, it's one of the best decisions I've ever made! Hey Tara yup super! Whatever grows is really really fine, it's like baby hair that you'll hardly notice it. Plus it really does make the skin smoother so it was worth it!